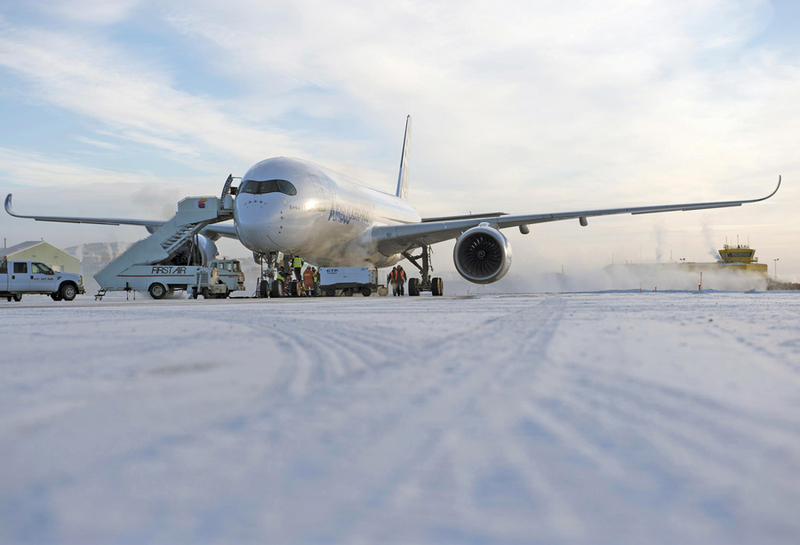 Airbus’s A350 XWB MSN 003 completed cold weather testing in Iqaluit, Canada, on January 28, just ahead of the Singapore Airshow. At the show, the OEM is presenting its twin-aisle A350-900, which is making its first full international airshow display. Here in Singapore this week, industry observers will be keen to understand the manufacturer’s plans for the smaller A350-800, which has seen a steady erosion of orders as customers have upgraded to the baseline model. As the Airbus A350-900 twin-aisle twinjet makes its first full international airshow display here in Singapore this week, industry observers will be keen to understand the manufacturer’s plans for the smaller A350-800, which has seen a steady erosion of orders as customers have upgraded to the baseline model. With average aircraft seat capacity moving inexorably to the right, Airbus executives are also mulling a possible double-stretched variant beyond the longer A350-1000. Currently, the A350 family comprises three variants flying up to 8,500 nm. Typical two-class cabin layouts see the A350-800 offering 276 seats, with the A350-900 and the A350-1000 accommodating 315 and 369 passengers, respectively. Airbus recently has launched a complementary 6,800-nm range “regional” model. In January, the A350 backlog covered 812 aircraft, including about 550 A350-900s and 180 -1000s, from 37 customers. Airbus (Booth J23, Chalet CD19) hopes the A350 display here will demonstrate “maneuverability, sleek design and exceptionally low noise levels.” The aircraft scheduled to fly on the show’s opening two days is MSN 003; this aircraft, together with initial example MSN 001, had logged more than 890 hours in 185 flights by January 22. Two more aircraft–MSNs 002 and 004–are scheduled to fly this month, ahead of MSN 005, the final flight-test example, which should fly before June, according to Airbus. MSNs 002 and 005 sport airline cabin interiors, while MSN 006 (the first for launch customer Qatar Airways) is expected, following certification, to be handed over by year-end. With a shrinking A350-800 order book, Airbus has adopted a pragmatic “take it as it is or wait for a bigger one, we’ve other things to do” approach to the marketplace. It is increasingly moving engineering capacity on to the A350-1000, which is running two to three years after the baseline model. A350-1000 backlog is three times that for the A350-800, which in December had dwindled to about 60 after American Airlines upgraded 18 orders (placed by merger partner US Airways) to the -900. This decline, stimulated somewhat by the manufacturer’s own marketing initiatives, illustrates an established trend that since about 2007 has seen industry backlogs for 300-passenger machines increase by a half from around 400 to 600 or more, while those for 250-seat jetliners have fallen by about 40 percent from nearly 1,000 to little more than 600. Among principal remaining A350-800 buyers are Irish lessor Aircraft Purchase Fleet (12), Russia’s Aeroflot (8), Asiana (8), Hawaiian Airlines (6) and Yemenia (10). Of those, Asia Pacific operator Hawaiian has said it does not require greater capacity, but last month was reportedly “in discussions” with the manufacturer. Airbus chief operating officer (customers) John Leahy has said that A350-800 customers face a choice: accept aircraft at the current 276-seat specification or wait “a couple of years” for a possibly larger version. If airlines do stay with their present bookings, the manufacturer could face its own dilemma, since the model has always been slated for a 2016 service entry, a year ahead of the Series 1000 on which it now is concentrating engineering effort. Leahy wants to keep the A350-1000 on schedule, since this will generate higher sales income from the larger machine, while production capacity considerations are thought likely to push a revamped A350-800 back to at least 2020. In response to customer reaction, Airbus officials revealed last month that it had been considering a larger version of the A350-800, which originally was to have been an optimized 275-seater but subsequently has become a less-efficient “A350-900 shrink.” Leahy said it is “a distinct possibility” that a bigger -800 might appear. A new variant offering perhaps 290-plus seats (assuming two extra seat rows) would have a reduced range, but would probably still have longer legs than the A350-900. While mulling potential A350-800 changes, the manufacturer acknowledged genuine industry interest in an “A330neo,” stimulated by popularity of the A320neo project. “Re-engining is always an option,” said Leahy. Such a development could also see Airbus replace the A330’s aluminum alloy skin panels with sheets of lighter aluminum-magnesium-scandium alloy, for which it is developing a demonstration model. The company said the alternative material, which is also more corrosion and fatigue-resistant than previous alloys, can be adopted using current manufacturing and production tooling. An A330-inspired development already going ahead is the A350 Regional–a lighter, 250-metric-ton model powered by derated 70,000-pound-thrust Rolls-Royce Trent XWB engines and flying up to 6,800 nm. It is expected to offer about 355 seats in a single-class layout.